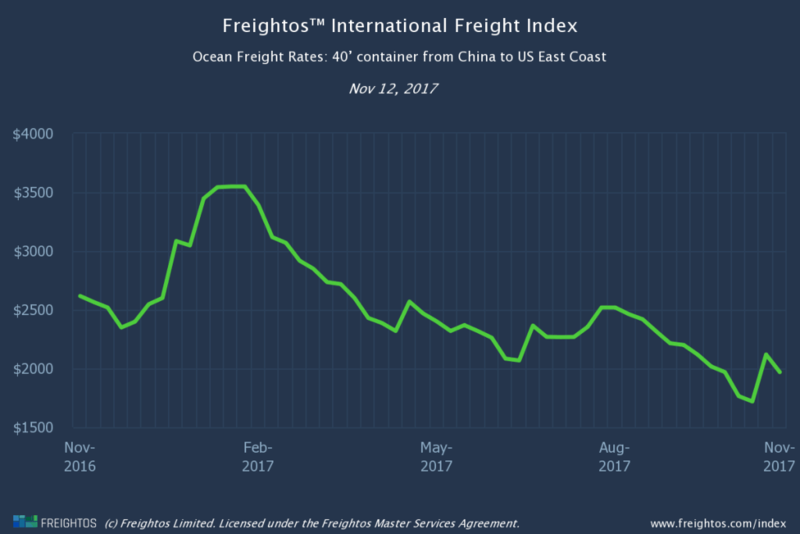 A Tale Of Two Cities, But At Long Last Ocean Freight Rates Are Rising. Dickens may not have had freight on his mind but for peak season…it’s truly the best of times and the worst of times. For air cargo, peak season was seemingly in full swing even before it began. Strong e-commerce sales have already driven incredibly strong growth this year. Singles Day, which, at $25 billion in sales, grew by 39% YoY, as well as impending Black Friday deals, is supercharging peak season as well. Add to that, Apple’s latest iPhone release in November, as opposed to a typical September release and you’re looking at incredibly tight airspace at major China hubs. Over the past three months Shanghai (PVG)-New York (JFK) air rates have shot up by 70%, while Shanghai-Frankfurt rates have literally doubled. But it’s been a different story for ocean carriers. Irrespective of movements in tonnage, supply far outstrips demand. Consequently, they’ve been watching rates fall over the most part of what is supposed to be their peak season. The drop has finally flagged, with November 1 GRI’s implemented at around $300-400/TEU. Last week’s rise temporarily stemmed ten straight weeks on the China-US East Coast lane. China-US West Coast and China-Europe rates fared better, rising again this week. But China-US West Coast rates still lag 8% behind where they were this time last year. And with no capacity issues and no mid-month GRIs set for either China-US lane, rates are set to fall back until the next GRI jolt on December 1. Air freight rates are incredibly tight, driven by a bumper e-commerce season. This week and last week, China-US West Coast rates were higher than at any time since the CNY peak (Week 8). Despite rising last week, China-US East Coast rates are still a massive 28% behind where they were this time last year. The China-Europe lane is tighter for space than the China-US lanes. Rates have increased three weeks in a row and are now catching up with rates this time last year. Some carriers have announced a mid-month GRI. Europe-US East Coast rates also increased this week, but like the three other major lanes are still down on last year.